I wake with a jolt that has me sitting straight up in the tent in pure panic. I am trying to gasp for air but no air seems to be going in. Judi is fast asleep. My body feels frozen and I can’t move but my mouth is open trying to get air into my lungs. All that I can hear is my own gasping as I desperately try to get some air to fill my lungs. I feel like I am suffocating. Judi is still sound asleep on her side of the tent. I want to wake her to help me but nothing comes out of my mouth. I feel like I’m about to pass out yet I can’t scream for help, the campsite is dead quite. With the overwhelming sense of the walls closing in around me, I fumble desperately in the dark and I burst out of the tent and gasp in the cold night air. My lungs expanding enormously as I gulped in the ice-cold fresh mountain air. It is still snowing outside as my entire body starts to shake. Camp is dark and quiet, everyone is still sleeping. I have no idea what time it is. I take in deep breath after deep breath. Slowly my body begins to relax. I have never been so scared in all of my life. I don’t know how much time has passed but my breathing has finally slowed and I climb back into the tent and zip up the flap, leaving some open to give me some fresh air. I’m nervous as I lie back not quite sure if that was a panic attack, altitude problems or what it was. All I know is how scary it feels not to be able to breathe and I’m worried it is going to happen again. It is a sobering reminder about the need to be humble in the shadow of this mountain. As morning rolled around the memory of what happened a few hours ago is fresh in my mind and I share it with Judi when she wakes. I find out that at some point during the night the exact same thing happened to Judi, she woke up unable to breathe and wondering who she could call for help. Soon we were to find out that we were not alone in our nightmare of no oxygen during the night for other members of our team had experienced it too. It wasn’t long before we all realised that during the night we had such heavy snowfall that the snow had literally snowed us into our tents, in the process covering all our air vents and trapping any fresh oxygen getting into our tent leaving us breathing in deadly carbon monoxide, which was slowly beginning to poison us. The consequences could have been tragic, but that night, sleeping high up at 5500m, God had definitely been watching over us. 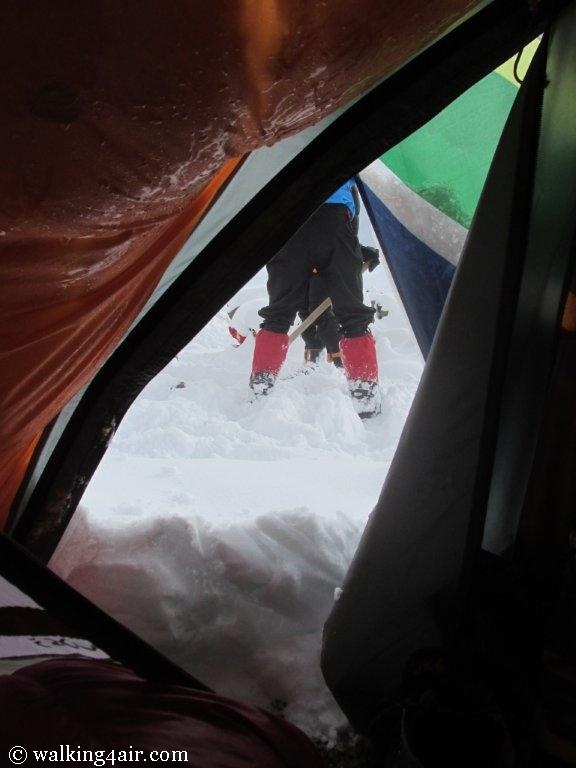 Grateful to have survived the horrors of last night, we watch as other teams begin to dig their tents out of the heavy snow that had fallen overnight. Snowed in at Camp 2! 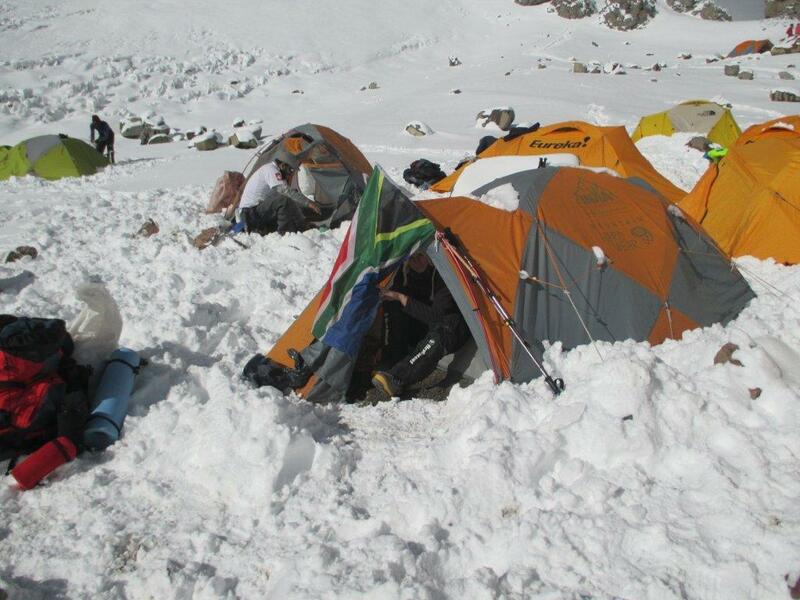 Other teams can be seen scrapping snow away from their tents. 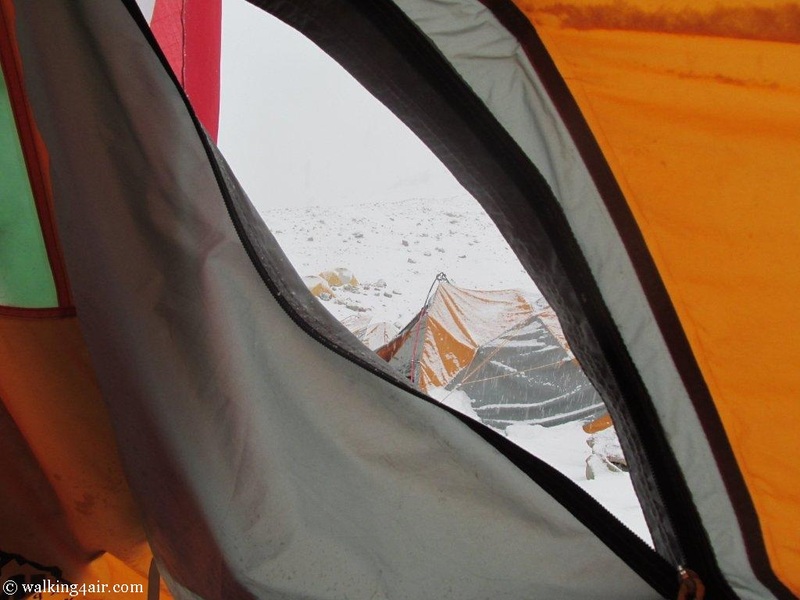 Me peeking out of our tent in a cold early morning at Camp 2 after getting snowed in during the night. Today we are packing up Camp 2 and moving up to Camp 3 called Camp Colera sitting up at 6000m, our final camp before our summit push. As if last night wasn’t bad enough, the morning is off to an emotional start once again. One of our team members has been taking a pain tablet and our lead guide has just found out about it and he is not very happy at all. There is some shouting and tears. It’s awful to watch. Emotions are high. 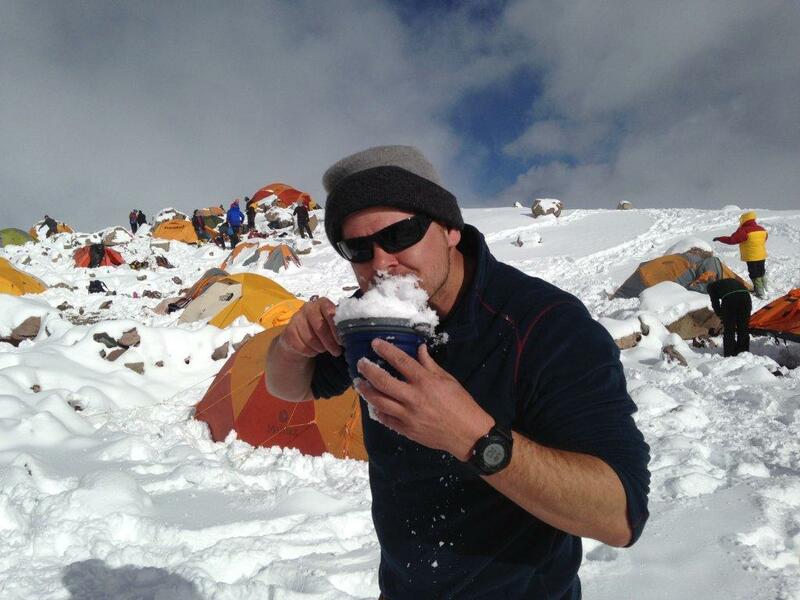 Apparently there is an ingredient in the pain tablet that is dangerous at altitude. Our team-mate must stop taking it immediately. Angel’s anger, although seemingly harsh, is understandable, he has our best interests and heart and we are his responsibility and he wants to ensure our safety. We learn. We adjust. We keep moving forward. Today’s climb will take me to the highest altitude I have been to yet. 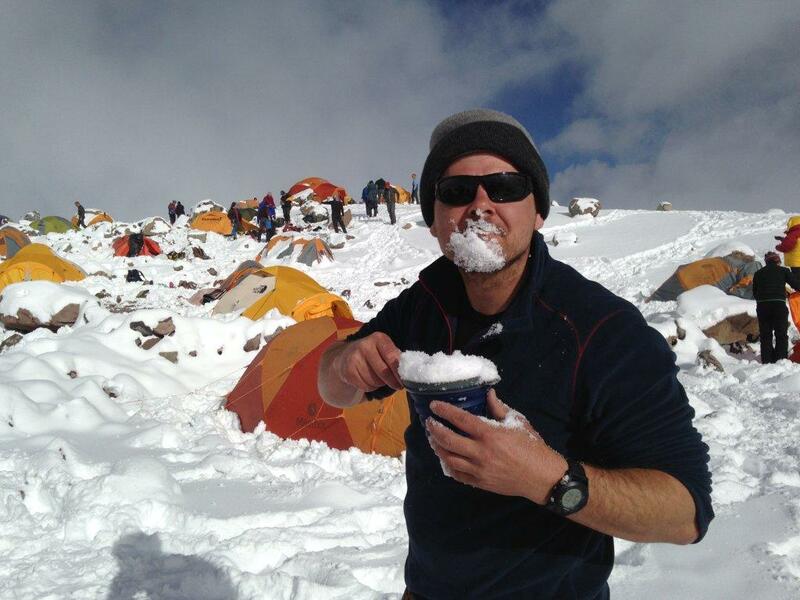 Kilimanjaro is 5895m, the highest I have been, but tonight we will sleep at 6000m. As we packed up our tents, Simon offers to go and get us fresh water again. The stream’s iced over top had been broken open and everyone is urged to go and get water before it froze over again. The glare from the snow was blinding and everyone had to ensure they had their goggles on or reflective sunglasses on to prevent snow blindness. A sticky oats breakfast filled our tummies and soon it was time to be on our way. 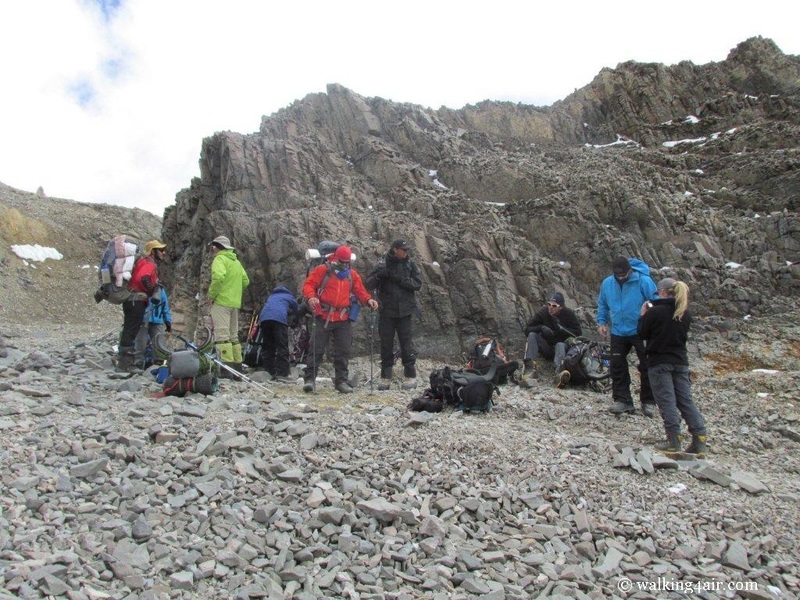 We had missed load carries (acclimatisation days) and rest days now and this time tomorrow we would be on our way to the summit. I can hardly believe it’s here! Me, not looking too impressed, standing with Simon and Daniel as we try hard to put sticky oats down our throat. I blame the oats entirely for the look on my face!! After the night a number of us had had, it was good to laugh and play around. My chest infection is getting better ever so slowly. I feel so much more human than I did three days ago, the antibiotics are working well. I feel stronger and ready to face what lies ahead. Steady does it I keep reminding myself, my dream is only hours away. Teams packing up. 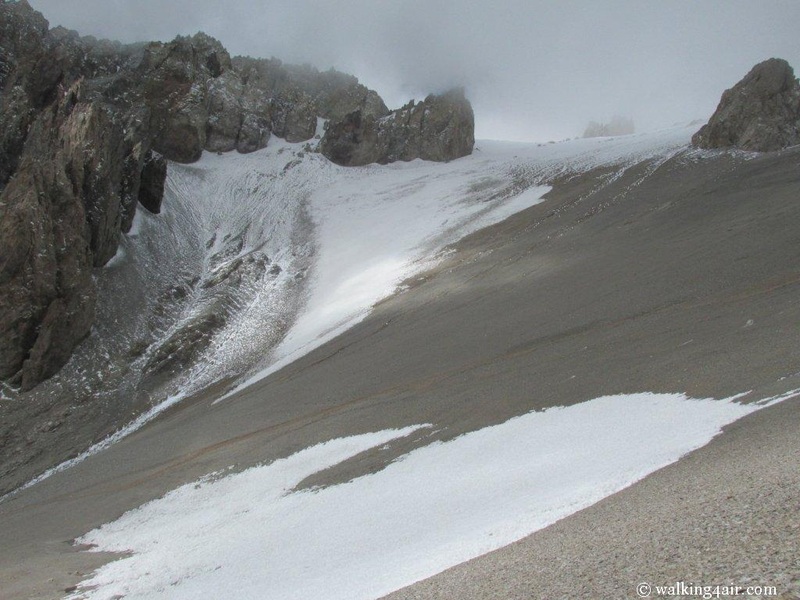 It was almost time to move up to Camp 3. 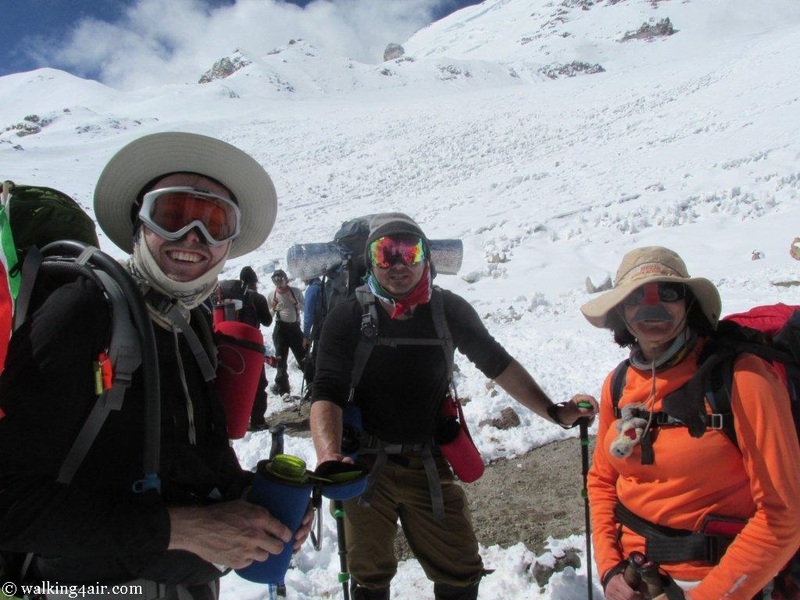 Simon, Daniel and Judi ready to rock and roll to Camp 3. 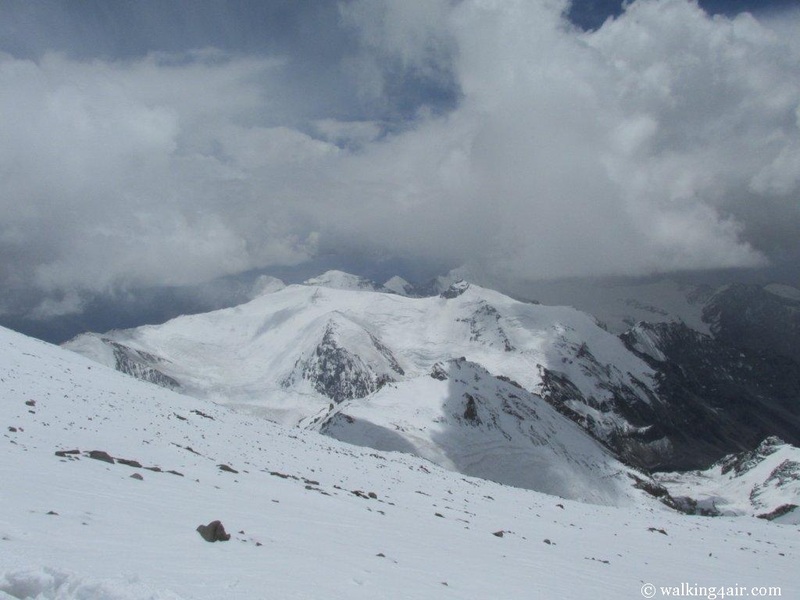 Breath-taking views from Camp 2. 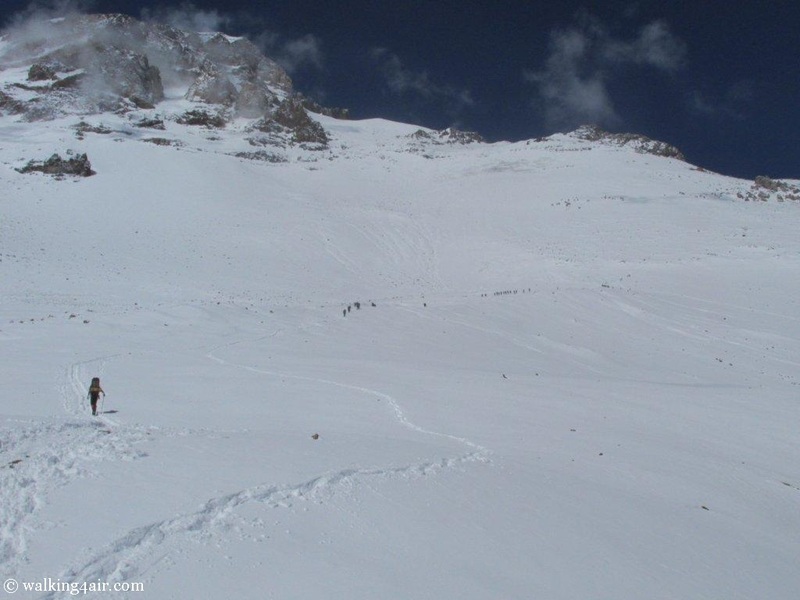 If you look carefully you can see teams slowly making their way up to Camp 3 from Camp 2. 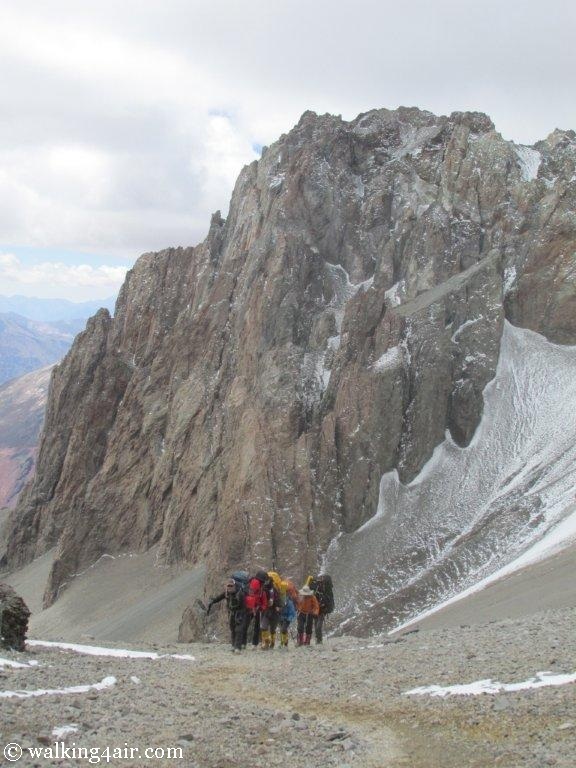 The climb up to Camp 3 was a slow climb with the team walking together the entire way doing the rest step. Whenever my mind began to wonder I would bring myself back into focus by saying my mantra as I walked the rest step. Cure. Cystic. Fibrosis. STEP. Cure. Cystic. Fibrosis. STEP. 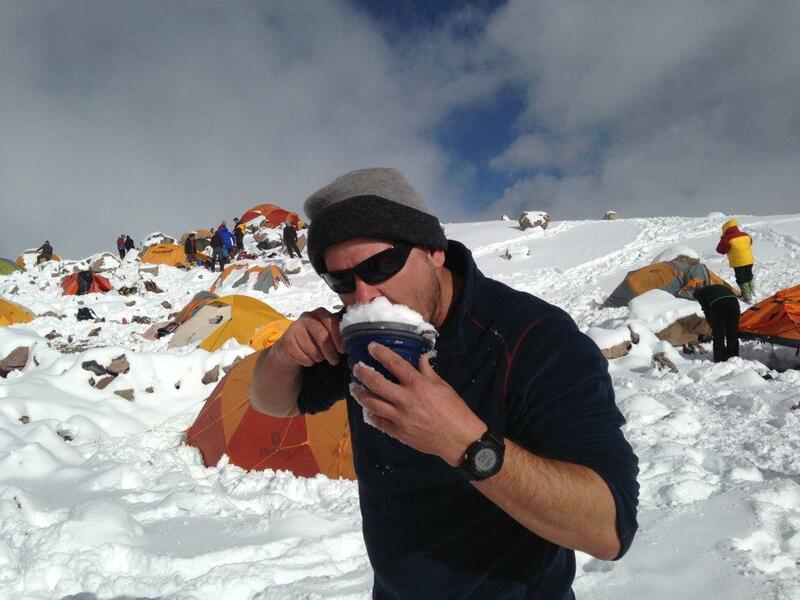 It seemed to help with everything, regulating my breathing, keeping my steps steady, aiding the steep climb to Camp 3. 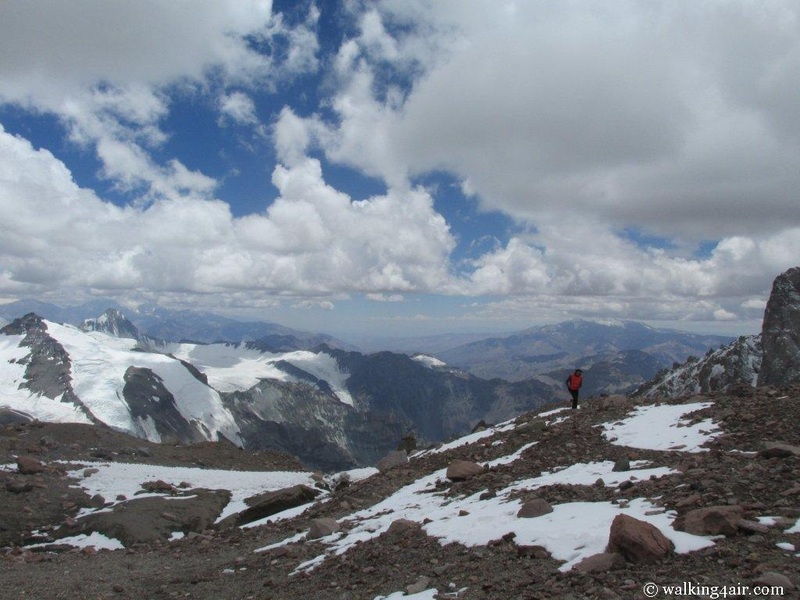 The rest step is painfully slow but at this altitude and having lost acclimatisation days due to the bad weather approach, it was the only way to move forward. I knew my body was grateful for the slower pace and the team walking in union. 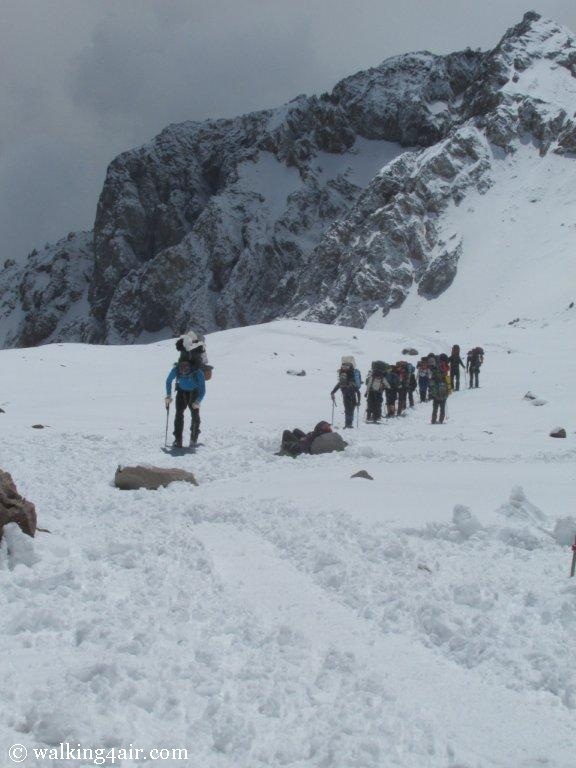 The snow was deep in places and the walking was exhausting. Love this amazing photo taken by *Simon Bates* As our team and another team behind us made it up over a steep climb this was snapped. I’m 2nd from the front with my hands up in the air. Yes, I was feeling invigorated and alive!! Every so often the team would stop for a rest. The views that unfolded before us were completely breath-taking! It sure adds to one of the reasons why I climb mountains, because where else in the world do you get to experience views such as the ones that lay before us. Another team, doing the rest step, coming up behind us. 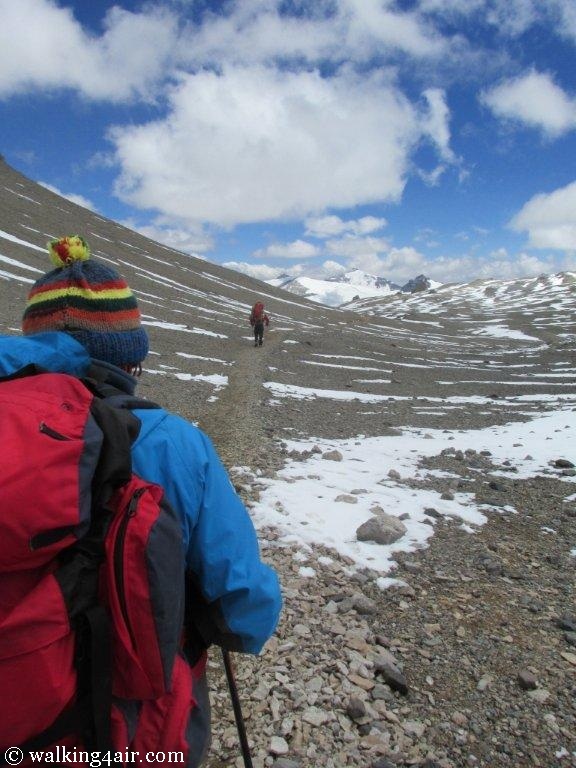 Incredible views as we make our way up to Camp 3. This photo of me was taken on a rest stop as we made our way up to Camp 3. 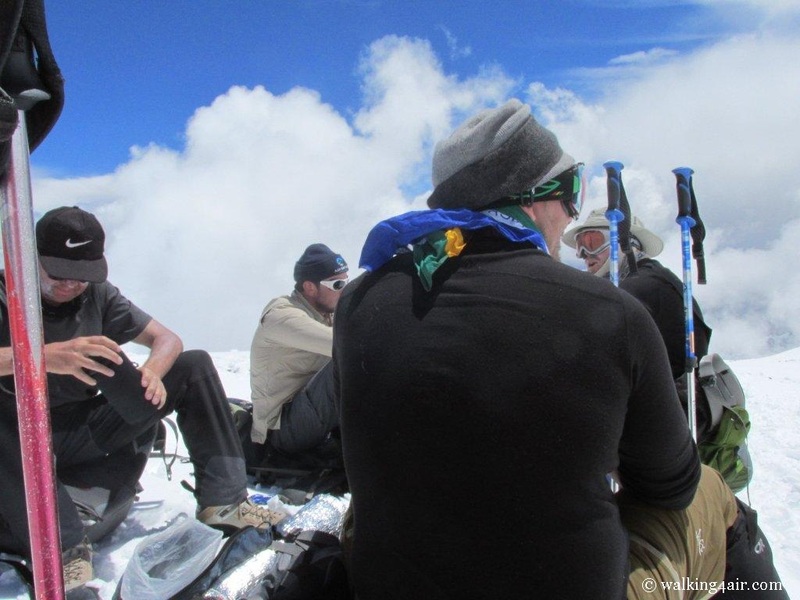 Our team on a break, enjoying the views and a rest. Adrian, our fabulous guide with the weather changing fast behind him. On top of the world ~ literally! Because Everest season is not open yet we literally become the highest climbers in the world! We made it into camp in good time and we had the entire afternoon stretch out ahead of us. The weather is miserable. Our amazing guides have already set up our tents for us. They are doing everything they can to assist us. They are truly amazing! It was going to be an afternoon spent resting and ensuring all our stuff for our summit was ready to go. As I stood in camp, I watched as the strong winds were already whipping around the orange tents that made up camp. The bad weather was due to hit by tomorrow afternoon but it was already starting to come in. I can only stand in awe and watch. I snapped a few pictures but quickly placed my camera back in my jacket before my camera froze. I knew I needed to keep the batteries warm to revive them. At extreme cold batteries lose power extremely quickly and I knew I had to keep my batteries alive for the summit push. It is freezing outside and it’s time to retreat to my tent. As soon as I unzipped the tent flap, I fell onto my backpack and my unrolled mattress. With my feet still poking out of my vestibule, I removed my snow boots and placed them inside, where I will have easy access to them in the early hours of the morning. To ensure that no snow or ice will get inside, I stuff my gaiters inside the boots. Much to my surprise, I manage to inflate the mattress without passing out or getting light-headed, so that seems like a good sign. However, it does take considerable effort to just set up inside the tent and get my sleeping area sorted, something I wouldn’t have even noticed at lower altitudes. 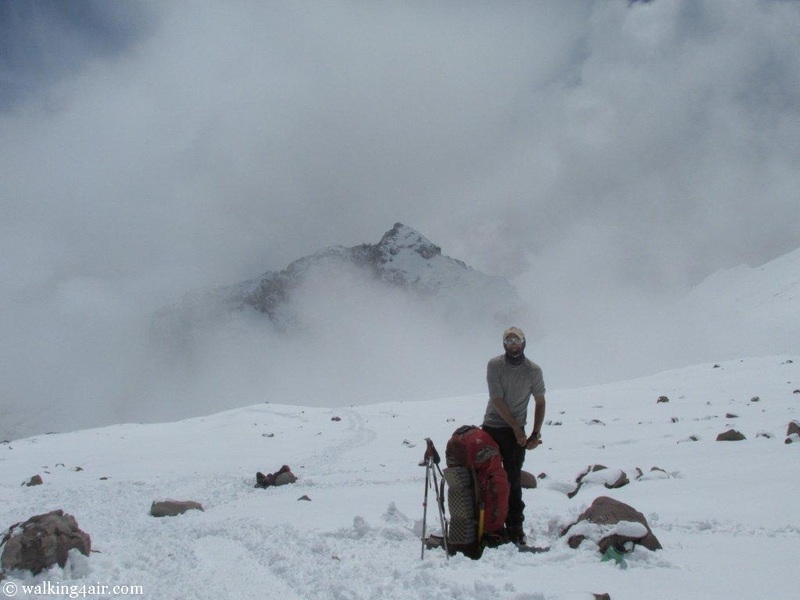 But that’s life at high altitude for you, simple tasks take triple the effort. The most important thing I’ve done on this trip is overcome a major mental hurdle. Getting sick knocked me down, but I’ve been able to get up and keep fighting. 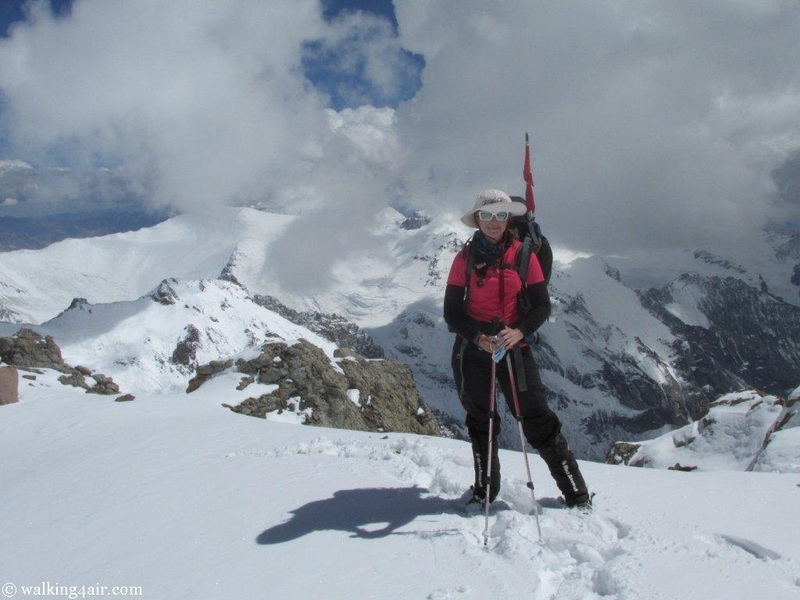 I fell like myself again – physically and mentally strong, and ready to take on the world and ultimately, the summit that lay in wait. I spent the afternoon snoozing, and then I packed my backpack and ensured all my summit gear is ready for me to climb into in the early hours of the morning. We will be waking up at 2:30am and we will be leaving for the summit 4am. Then I snooze some more. We get hot water brought to us and dinner in our tent again due to the high winds and the snow that is still falling. The feelings all mush together. Pretty much all the same feeling, just how I interpret it!! 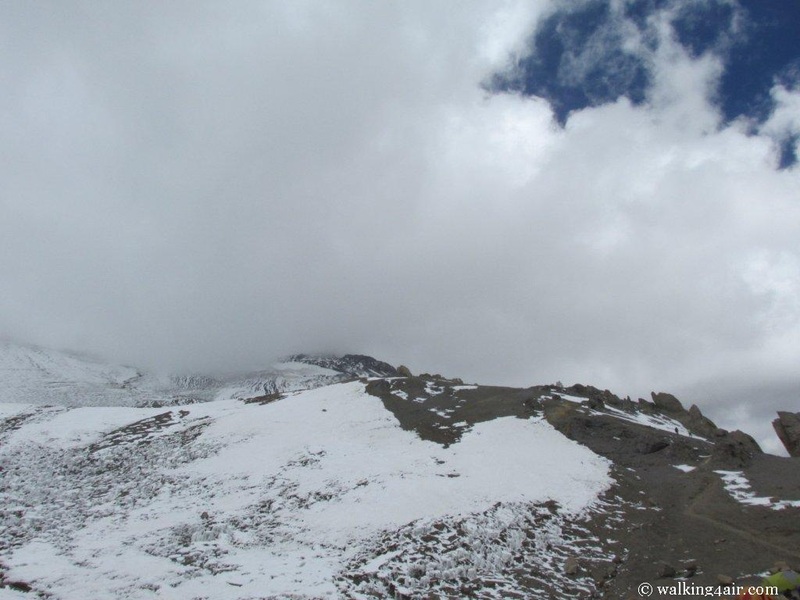 Tonight we sleep at 6000m, the highest I have been, and tomorrow we climb to the summit at 6962m. The air vents are all wide open in the tent tonight and as it snows outside we can only hope we don’t experience what happened last night again. I’m feeling good at this new altitude. I’m feeling stronger than I have felt in days. I am ready for the summit challenge. My snow boot inners, along with some clothes, my camera and my batteries are all in my sleeping bag with me to stop them from freezing. Tonight, it is full house inside of my sleeping bag! I take one last look at the photo I have of Emma. The emotions well up easily again. I ask her to walk with me to the summit. I don’t really know why I ask because I know she will be by my side the entire way. I say a prayer for my team, myself and all the other teams pushing for the summit tomorrow; I pray it’s a good and safe climb for all. I tuck the photo of Emma safely back into my backpack. I want it with me when I summit. I check one last time my banner is also in my backpack, ready for my summit. But first, a few hours more of sleep. 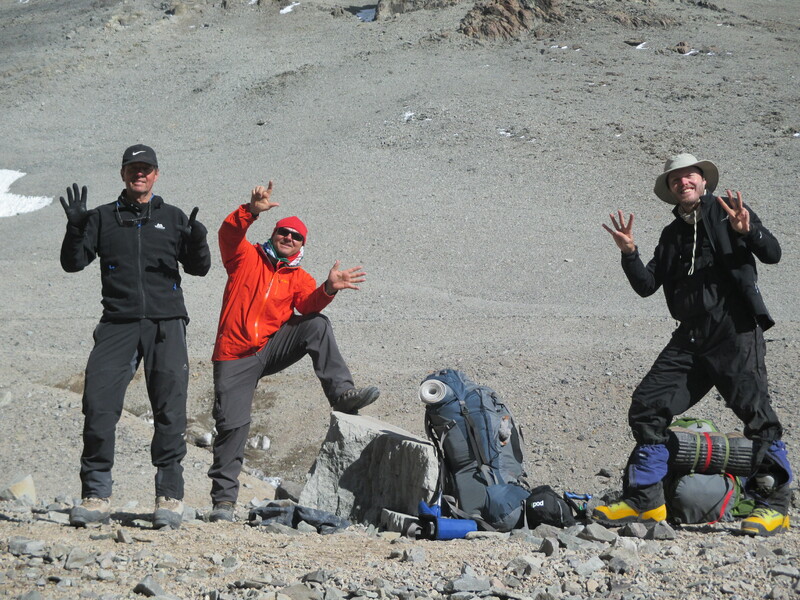 After a good rest day yesterday, the team was ready to move up to Camp 2 sitting at 5500m. 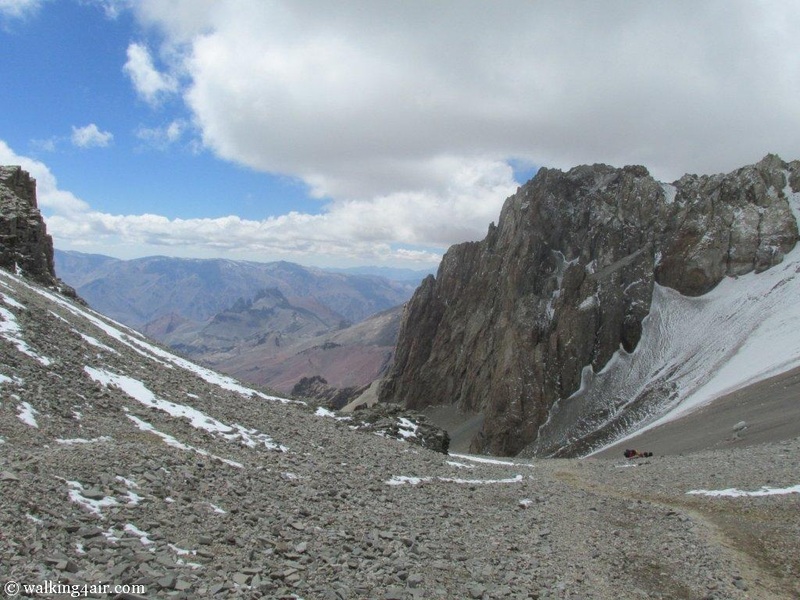 The journey would take 5 hours and the first section was going to be the steepest and slowest section. Thereafter we had some flat walking to look forward to before one final small climb up to Camp 2. 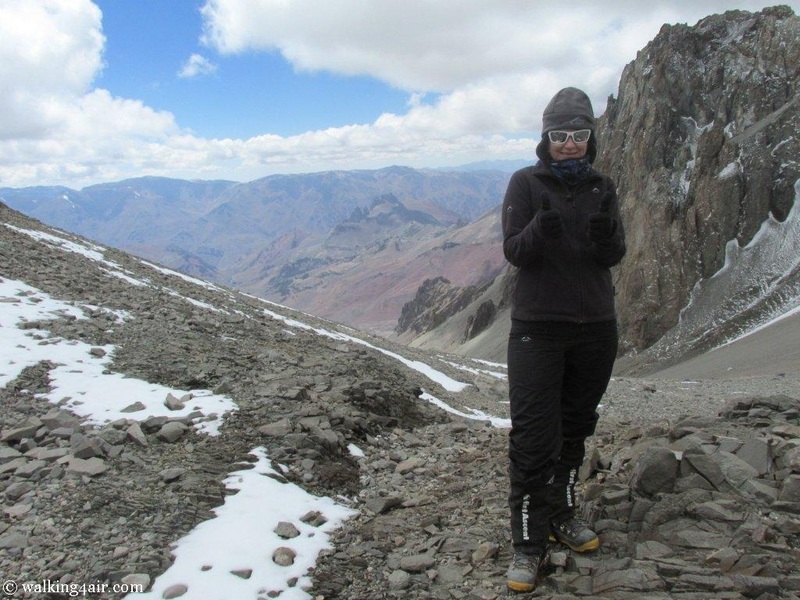 As I lay in my warm sleeping bag, I braved my now frozen wet-wipes to freshen up and then slipped on my layers of clothes, ready to climb to 5500m. The antibiotics I was taking seemed to be working slowly and I was feeling ever so slightly better. The rest day yesterday had certainly helped too. I deflated my air mattress and slowly, because at this altitude slowly is the only way you can do anything, stuffed my sleeping bag into its compression sack. Because from today onwards we have given up our rest days, communal porters have been arranged for the team to help lighten our loads as we will no longer do load carry’s. In one way I’m grateful for this new development but in another way I’m worried about my chest infection and moving up higher to a new camp every day and then finally pushing to the summit that same night, in the early hours of the morning. I hope today’s climb goes well and I can rest in Camp 2 before pushing to Camp 3. 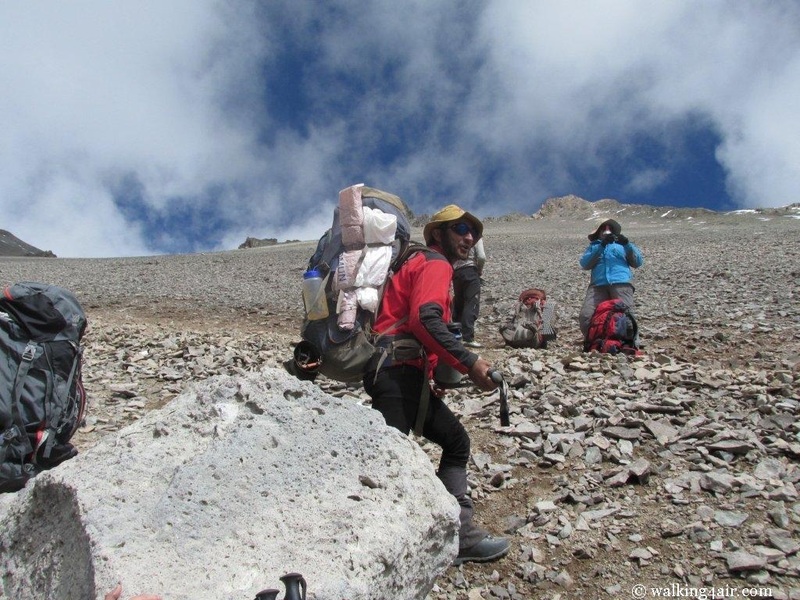 I check my pack to ensure I’ve evenly distributed the weight to balance my backpack properly. The items for the porter to carry have been passed on to our guides. This morning’s breakfast consisted of some very sticky oats. It was hard for me to push the oats down my throat but I knew I had to eat to give my body the energy it needed to get up to the next camp. As hard as I tried thought, I just couldn’t finish what was in my breakfast bowl. 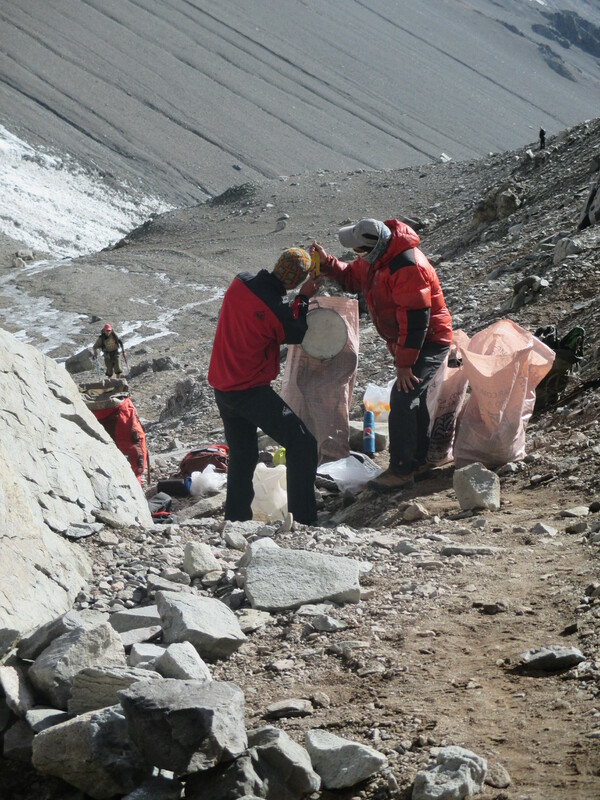 Our guides weighing the loads for the porters to carry. No load could be heavier than 20kg’s. *Photo by Judi Kurgan. After breakfast the team headed out, our climb starting almost immediately. A steep trail that leads to where the eye can no longer see. Once again the path zig-zagging its way to the top. With Angel leading the pack, the team moved forward together in slow motion as we all did the rest step. The path much more solid this time, making it so much easier to keep the steady but slow pace without sliding back down on scree. 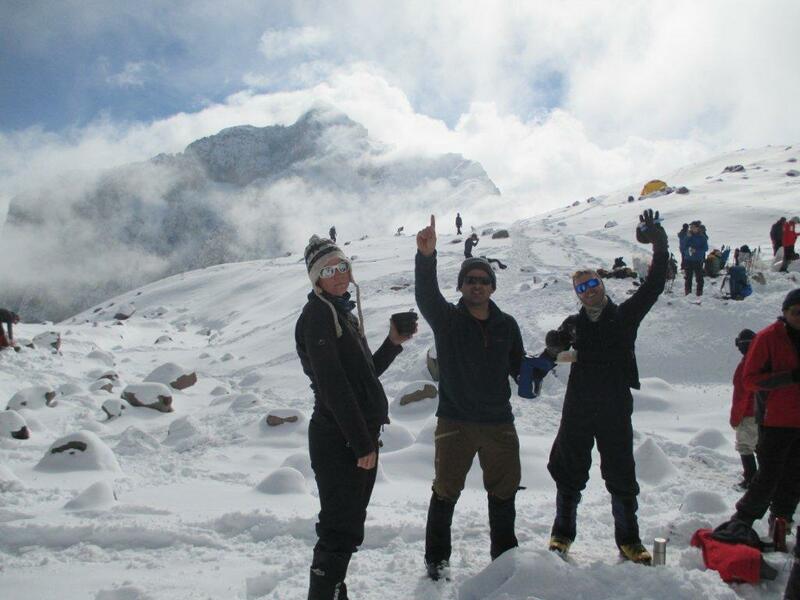 It was a slow climb to the top, everyone’s breathing laboured and hard, but this was nothing unusual at altitude. Although it was freezing cold today, patches of blue appeared in the sky and the view as we climbed was beyond spectacular. We stopped often for a water break on our climb to the top and to take in the view. 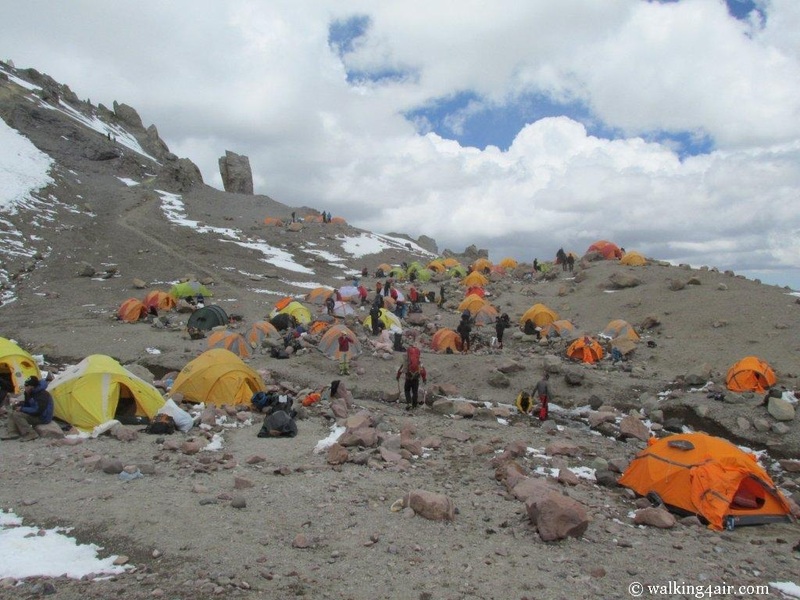 We would be in Camp 2 by lunch time, there was no rush. My backpack felt so light today making the climb so much easier. I was hugely grateful for the team’s porter help. The team continued to weaved their way to the top, finally cresting the top of the ridge where the most amazing views opened up before us. 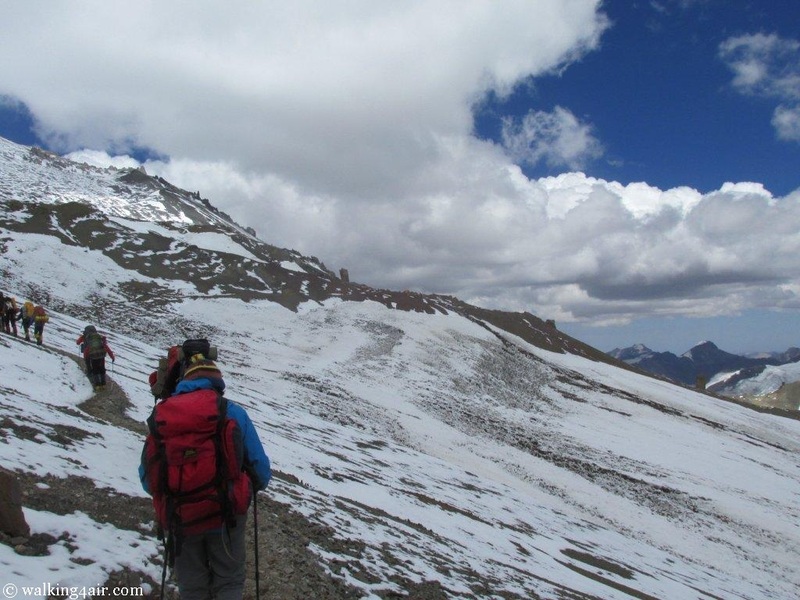 Two teams behind us were also making their way up, all of us on the mountain eager to attempt a summit before the bad weather approaching hit. 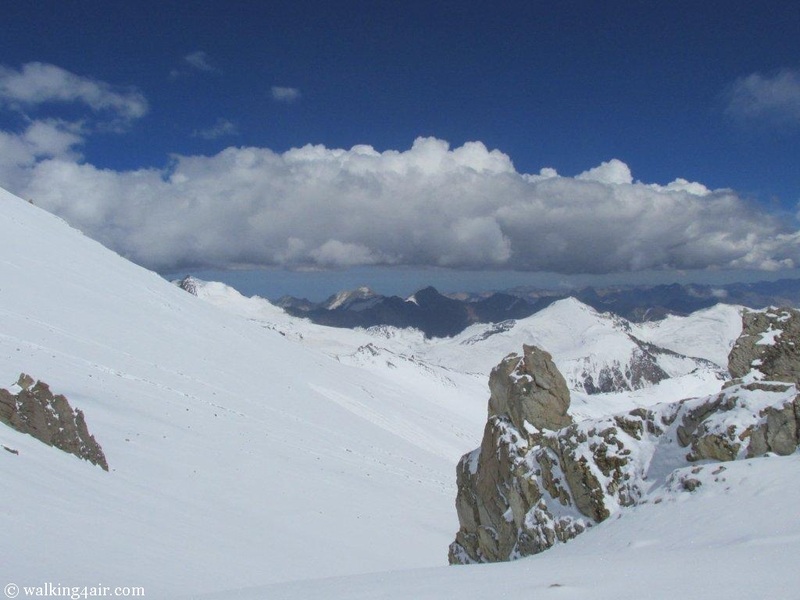 News was fast coming in that gale force winds and heavy snow was arriving on Saturday and the strong winds and bad weather was due to last at least 5 days, limiting the chance of summiting over that time. 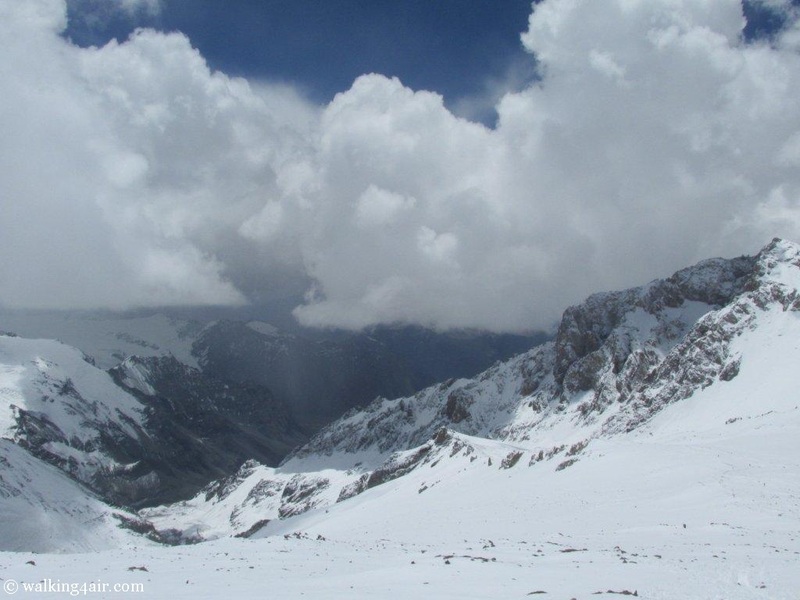 Our summit push would be in the early hours of Saturday morning if all went according to plan and by Saturday afternoon, after 12 – 14 hours of hiking we’d be heading back down into Base Camp and miss the bad weather heading for the high camps. 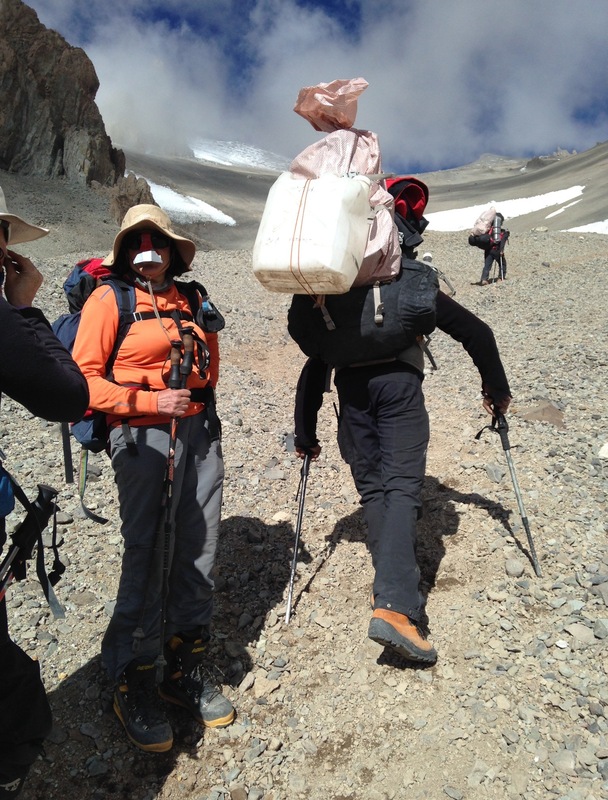 I prayed the team would all stay strong and I prayed I would get better, enough to allow me to summit, full well knowing that the body takes so much longer to heal at high altitude. 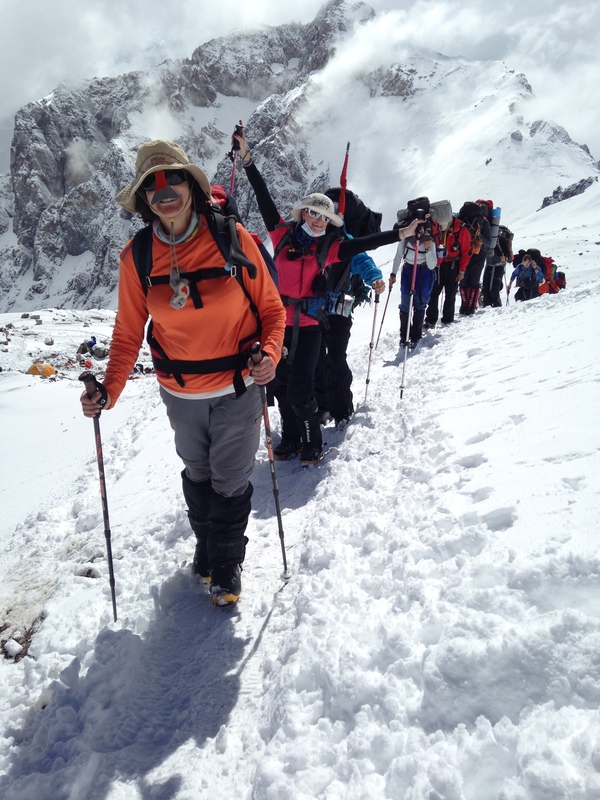 I believe in mind over matter and as I made my way to 5500m I had no doubt in my mind I would depart with the rest of the team on summit morning. Views as we headed out. As we made our way up the steep climb, this is what the view offered behind us. The team having a rest stop. 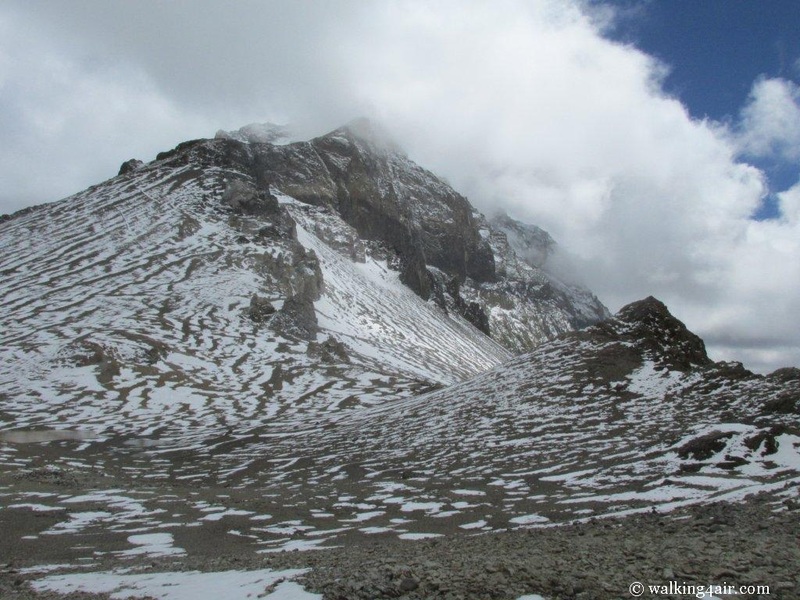 After a snack break and some photos at the top, the team began their walk across towards Camp 2. The walking was easy and flat and the views, just unbelievable. Today’s climb was somehow re-energising me, my purpose was clearer than ever. I thought of Emma a lot as we walked, this time her memories making me smile. I knew in my heart she was walking with me, still encouraging me on. The steep incline we had just ascended from Camp 1. If you look closely you can just see the team behind us making their way up. Looking like a pilot from the early 1900’s here but happy to be on top of that rather steep ‘little’ hill! Another team doing the slow “rest step” to the top. The team enjoying a rest stop before we continued onto Camp 2. The team behind us, almost at the top, still slowly making their way up. It wasn’t long before the flat turned into our last little climb up and there on up on the hill we could see the orange glow of Camp 2. 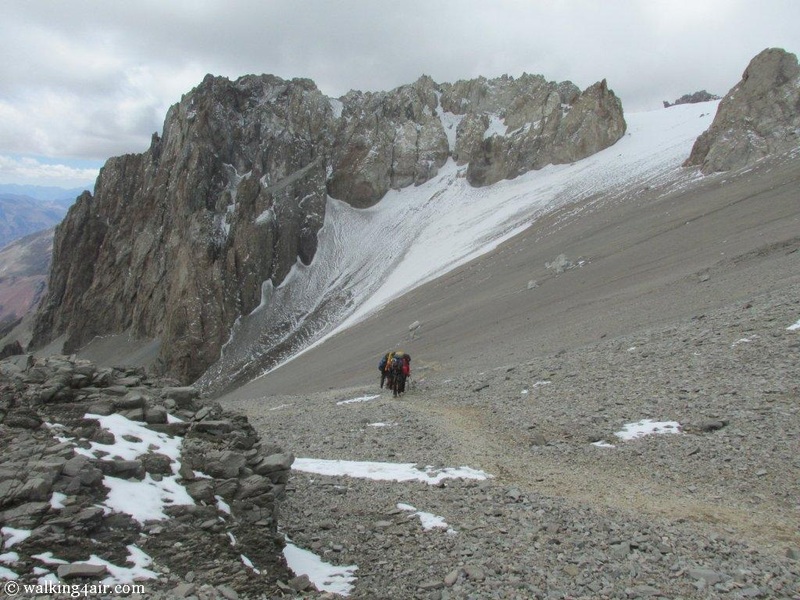 Beautiful views on the way to Camp 2. 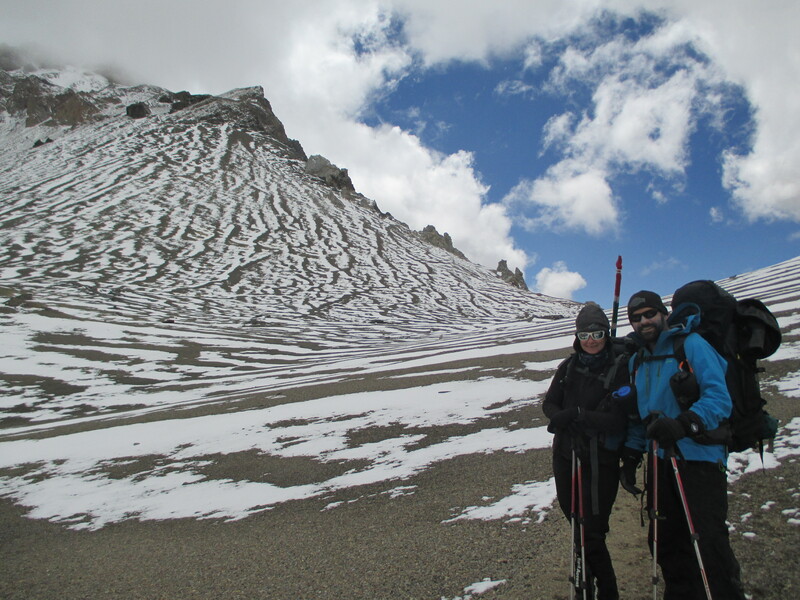 Steve, one of our expedition leaders, and I on our way to Camp 2. 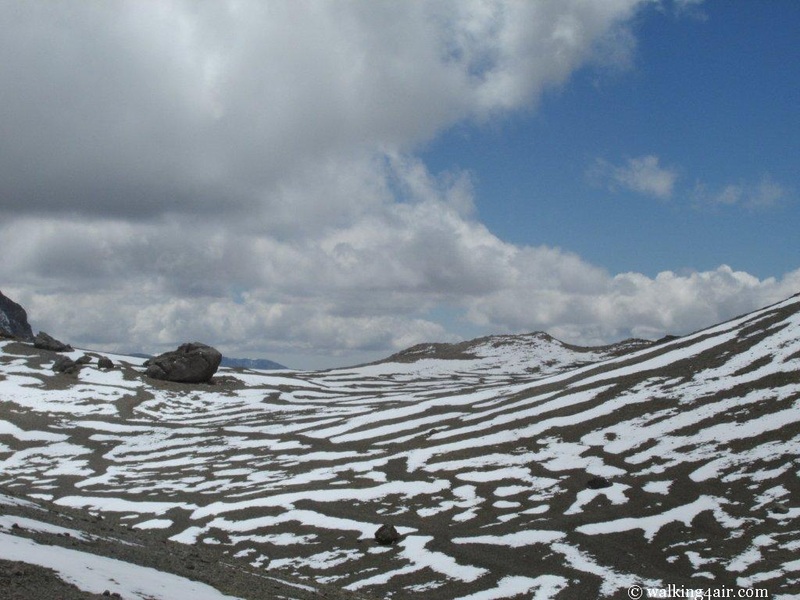 Zebra like patterns made by the snow as we headed towards Camp 2. Almost there, Camp 2 on the hill was in sight! 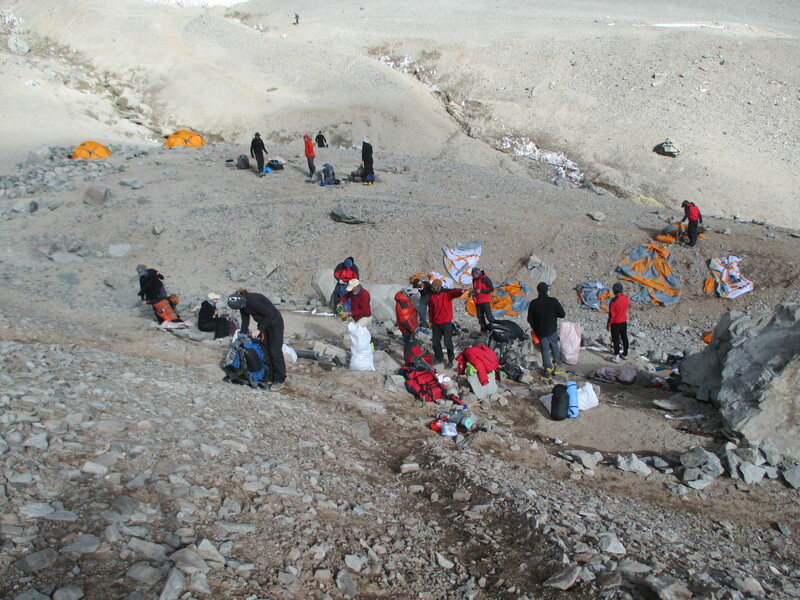 We arrived in Camp 2 at 1pm, just in time for lunch. We had made good time and made the journey in just under 4 hours. This is a busy but beautiful camp. The buzz, with all the teams on the same agenda as us now, is electric and the views, wow, the views are hard to describe. We truly on top of the world and we are taking in God’s world beneath us. I feel so incredibly blessed to be experiencing this. Camp 2, as beautiful as it was, was bitterly cold and before we could retreat to our tents to rest for the afternoon, we had to ensure we got fresh water before the stream froze again. 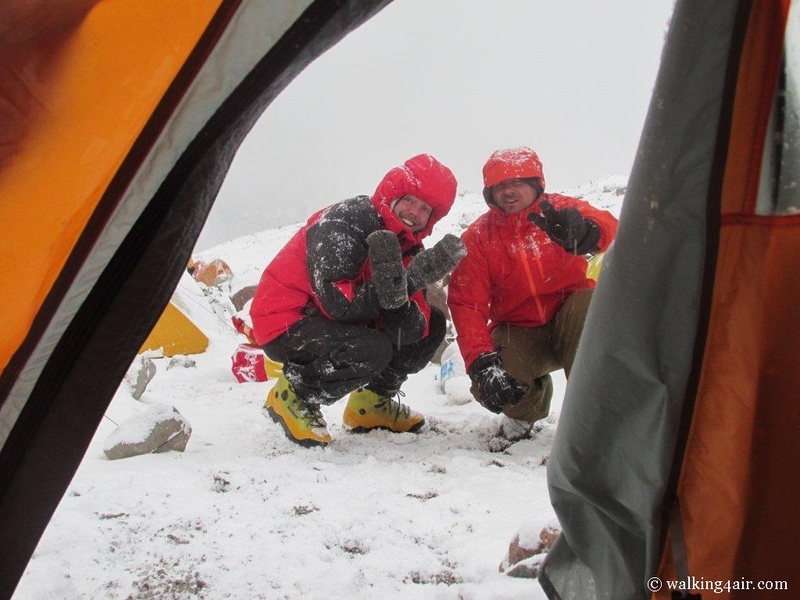 Once all the tasks we needed to do were done, and after some sight-seeing around camp, feeling exhausted again, it was time for me to head to my tent to rest before our climb to Camp 3 tomorrow. We had arrived, this would be home for the night. The amazings views from Camp 2. Finally settling down in our tent, taking off my boots, I lie down in my cozy nest. It is comfortable, soft, and warm. It feels good, comforting. I close my eyes and let out a long, deep breath. The stillness envelopes me for a few moments. Opening my eyes again I look up at the photo I’ve put up of my best friend, Emma. The reaction is involuntary. The lump in my throat actually hurts, the water in my eyes, real. The emotions at high altitude are real and raw. And again they cut deep. 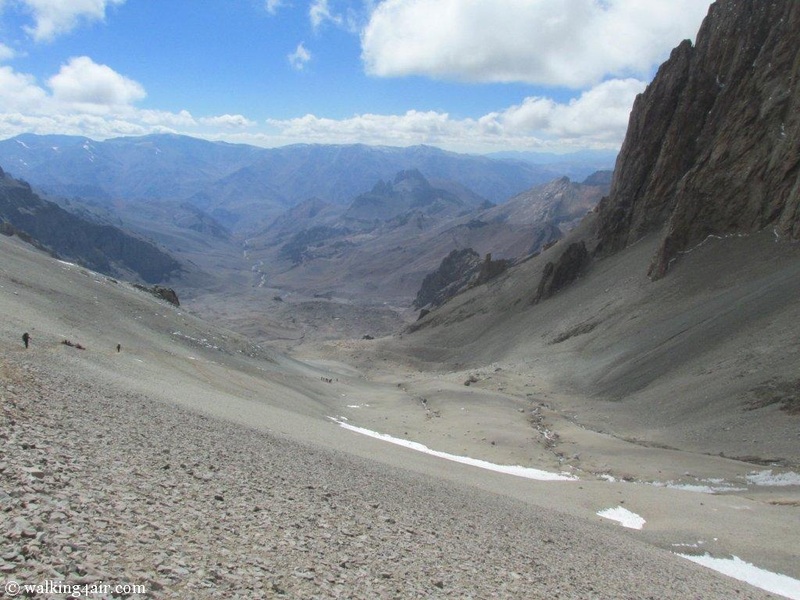 I missed my best friend very much, but here at 5500m I am closer to heaven and her once again. I drifted off into another deep sleep, it was still early and it was good to be resting only to be woken up with a jump. A heavy clap of thunder rolled into Camp 2, making me wide awake and alert, never mind giving me the fright of my life! Judi also stirred next to me. 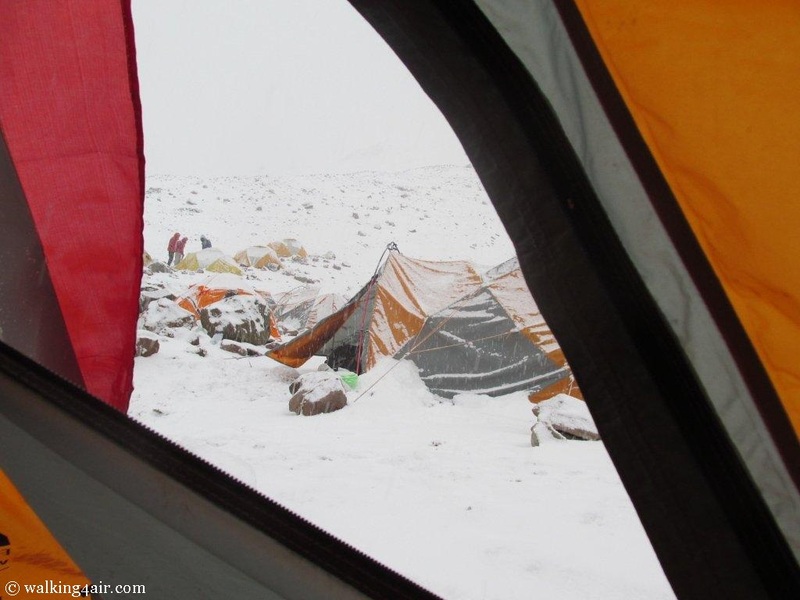 I peeked outside and it was snowing quite heavily, covering Camp 2 in a blanket of white. Lying awake, snug in my sleeping bag, Judi and I lay there chatting as a hectic thunderstorm played out in the mountains. Each clap of thunder was so loud; I literally jumped 10cm’s each time one clap of thunder sounded. Our tent didn’t feel like too much protection from the elements outside but I was certainly glad to be inside. A view from our tent as the snow fell outside. 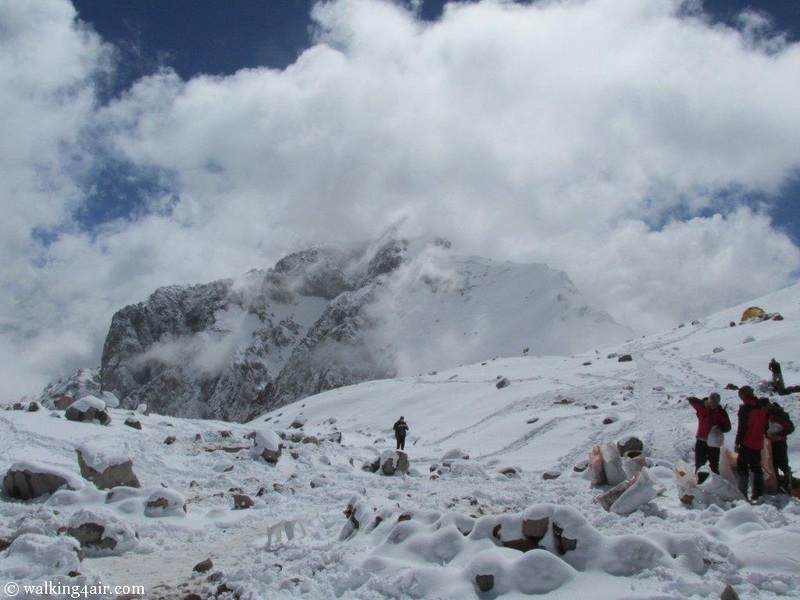 Camp 2 blanketed in a snow of white! Later this afternoon as the snow still fell, we had a few visitors to our tent. Angel brought us some nice hot water and Simon and Daniel pop over to say hello as did the lovely Lisa. 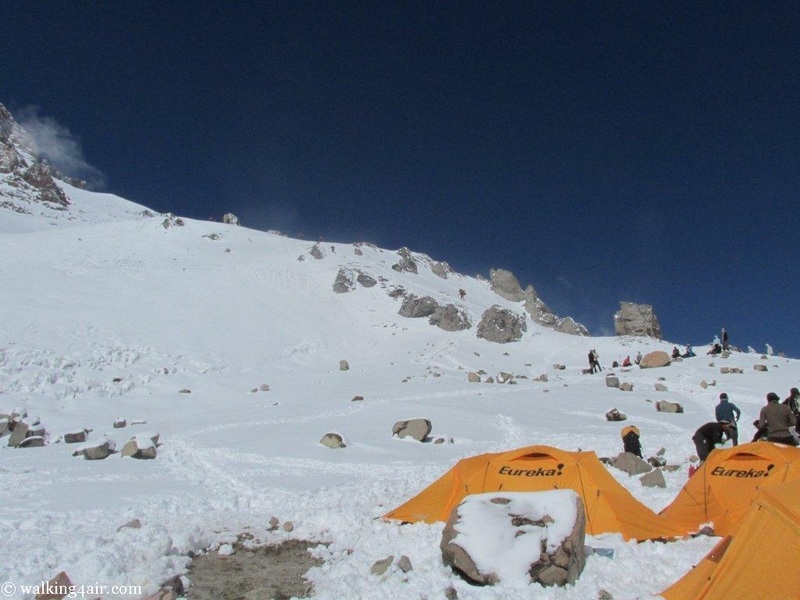 I was going nowhere , I was snug in my sleeping bag and that is exactly where I intended to stay until I had to get up to move to Camp 3! Simon and Daniel stopped by to say hello! Angel came to bring us some hot water for tea and later dinner. The lovely Lisa also stopped by to say hello! 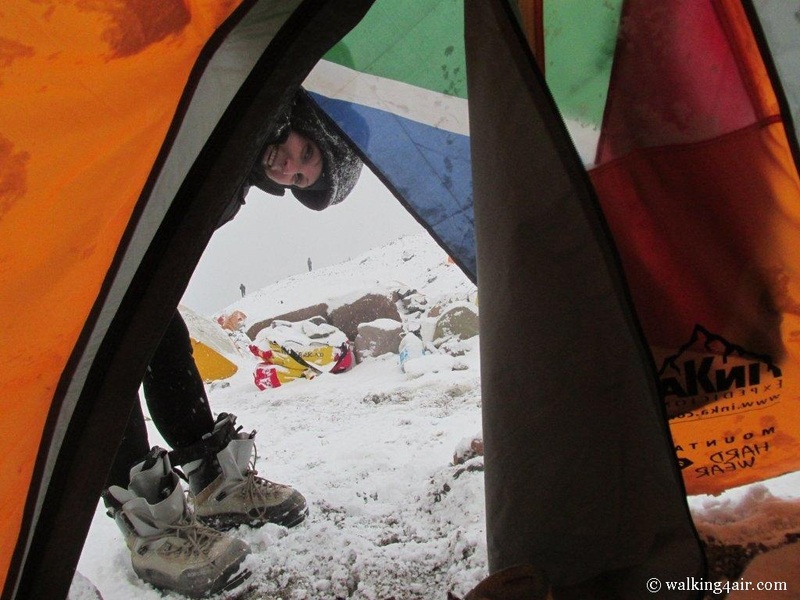 The snow continued to fall heavily and Angel came around to bring us dinner in our tents. He warned us to keep our vents of the tent open overnight to circulate the air. It was a warning that for Judi and I and for some of our team mates could have been tragically disastrous by the time morning light rolled around…. But that’s another story for tomorrow. 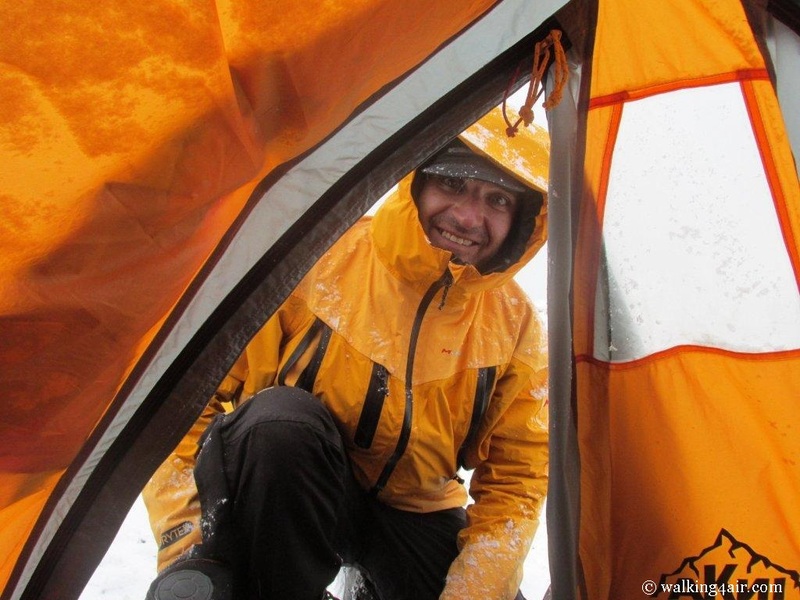 The snow was falling heavily, the wind was howling around the tents of Camp 2, it was 9pm and I was ready for sleep to take over again.